I have a dear husband who claims he doesn’t like beets. Roasted beets? No way. Borscht? Forget about it. So now that I have a refrigerator full of beautiful beets–classic red beets, sunny yellow beets, candy-striped chiogga beets–I wonder what I got into with this (otherwise amazing) CSA. That’s when the beet bean burgers come out (with some soy pepperjack and enough ketchup, those will pass muster). And the beet chocolate cake (because we have never met a chocolate cake we didn’t like). Burgers and cake will serve you well, but on the third week of beets, they won’t quite get you there. It was time to bring out the big guns: muffins. To you, a muffin may sound like a humble offering. After all, they don’t require much fuss to make and are not exactly gourmet fare. But for me, they were exactly what we needed to get through Beet Week 3. Why? 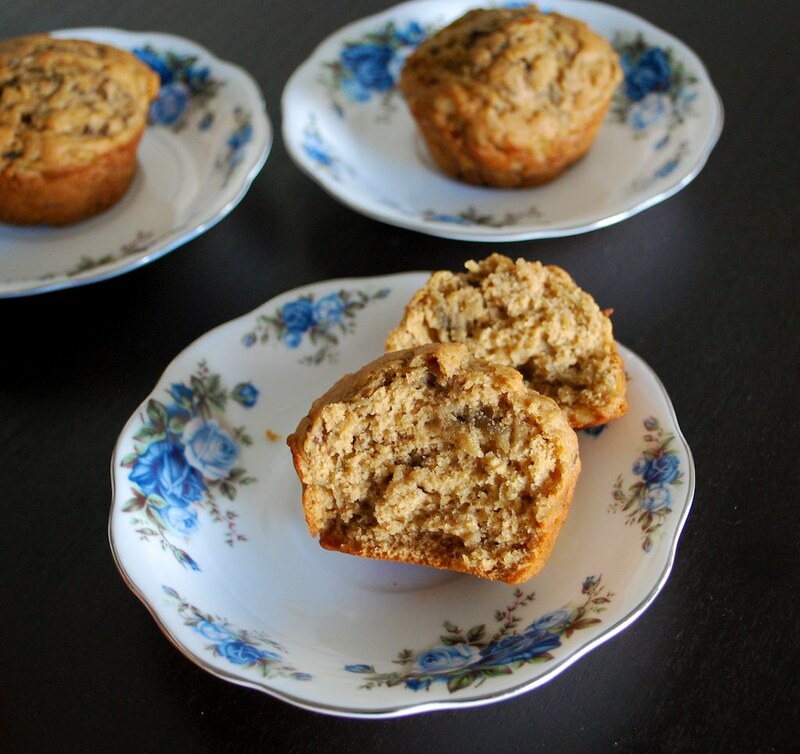 You can have a muffin for breakfast. A muffin with lunch. And definitely a muffin for dessert. When your muffins are whole-grain, low-fat, and full of über-healthy beets, you don’t even have to apologize for your new muffin diet. I developed this muffin to highlight and complement the unique beet flavor. The peach puree lends a subtle floral tang. The beets add great moisture and a distinctively beet-sweet flavor. Add a touch of cinnamon spice and some fragrant vanilla, and you have yourself a beautifully beet-y muffin. 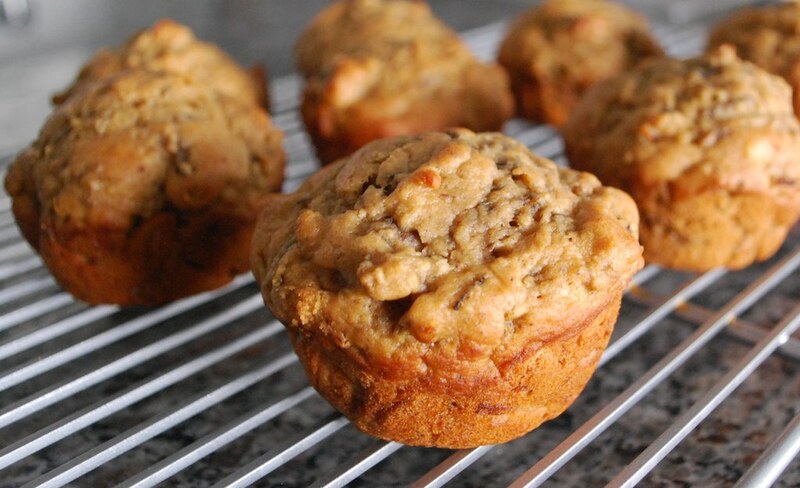 A muffin even a beet-skeptic could love. 1. Preheat the oven to 400 degrees. Grease a muffin pan. 2. Microwave frozen peaches for about 3 minutes, until fully thawed and softened. Add them to a food processor or blender and puree until smooth. Measure out 1/2 cup blended peaches. Set aside any remainder for a different use (stirred into yogurt, for example). 3. Whisk together the peaches with the rest of the wet ingredients, until well emulsified. 4. In a large mixing bowl, add the dry ingredients and stir to blend. 5. Pour the wet mixture into the dry, and stir until just combined. Fold in the beets and walnuts. 6. Spoon the batter into the muffin tin, filling each cup about 3/4 of the way. 7. Bake for 10-14 minutes, or until a toothpick comes out clean. NOTE: If you like your muffins just slightly sweet, then eliminate the 1/4 cup sugar in the dry ingredients. And, these are equally delicious with 1/2 cup applesauce substituted for the peaches. 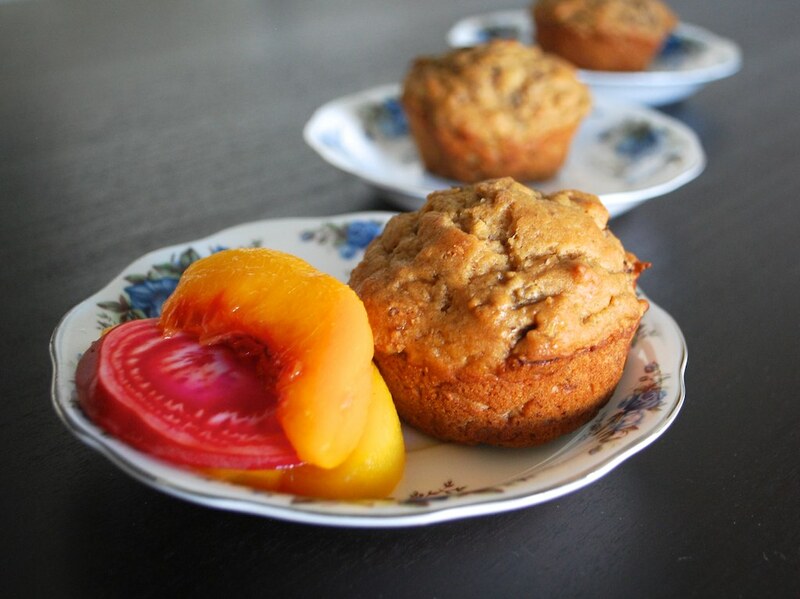 This entry was posted in breakfast, dessert and tagged beet, food, low-fat, muffin, peach, recipe, vegan, walnut, whole grain. Bookmark the permalink. The muffins looks fantastic. The recipe sounds amazing. It seems so delicious. This recipe is so fresh and creative! I love beets, I love muffins, so I’m going to have to try this. I wonder, though, why your muffins didn’t come out pink. 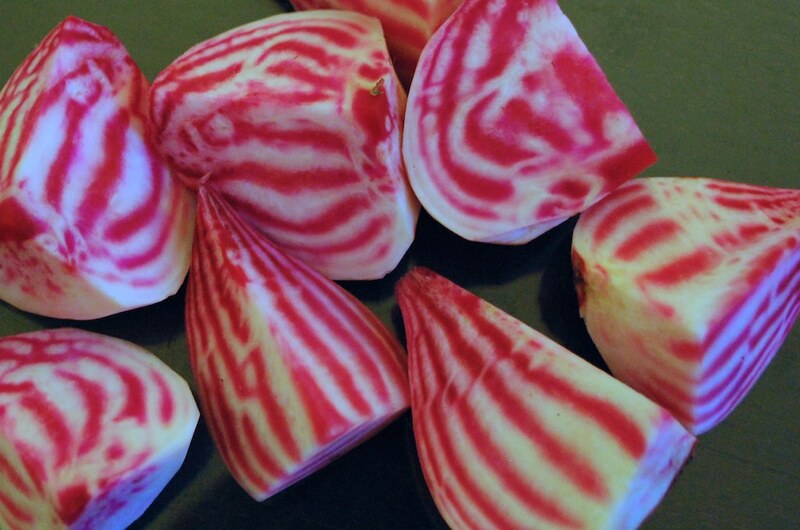 I have never seen striped beets before. I’ve never been much of a beet fan either, but these look interesting. Thanks for the great recipes! These have the best name ever! Can’t wait to make these healthy treats! Those muffins sound awesome to me! (I’m a big beet fan, as well as a healthy muffin fan.) Those beets are beautiful as well. Thanks for sharing!